If you’re looking for something fun to sit down and watch over the Christmas holiday, and you’re just not in the mood for another viewing of The Muppet Christmas Carol (although, really, who’s not in the mood for The Muppet Christmas Carol? ), might I recommend my very favourite film set in the Middle Ages (and I’m not ashamed to admit it): A Knight’s Tale. 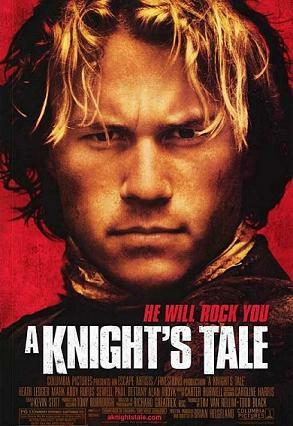 This 2001 film tells the story of peasant-born William Thatcher (played by the late Heath Ledger), who disguises himself as a knight and, jousting under the pseudonym Ulrich von Liechtenstein, wins his way to glory and riches and rocks the medieval world – defeating an evil count and winning the heart of a fair maiden along the way, naturally. Oh, and he also befriends Chaucer and the Black Prince. As a medievalist, every time I watch a film or tv series set in the Middle Ages, I struggle with the inevitable problem of keeping a running mental checklist of everything they’ve gotten wrong. A Knight’s Tale gets rid of this burden altogether by throwing historical accuracy out the window and going for a sort of fantastical realism. And it works, because, I believe, the tone and the spirit are just right. Especially when it comes to the tournament scenes. 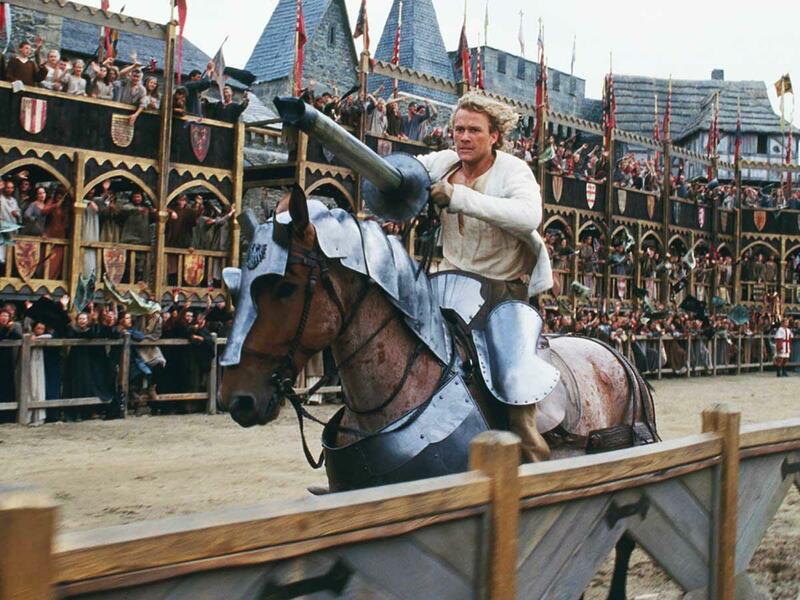 In the unforgettable opening scene, the audience at a joust sings Queen’s ‘We Will Rock You’ while the knights prepare for combat. Would a spontaneous rock musical have erupted at a proper medieval joust? Probably not, but the atmosphere of excitement, the energy in the air, and the investment of the spectators rings true. The tournament ‘circuit’ that William follows, as well, reflects the actual popular locations where medieval tournaments were held and where men like William Marshal made their fortunes. I like to think that the name of William’s character in the film is a nod to the famous Marshal, who once had his helmet bent and stuck on his head during a tournament – an excuse that William Thatcher uses at one point to avoid having to remove his own helmet and reveal his identity and surely not a narrative coincidence. William’s assumed name, Ulrich von Liechtenstein, is also a bonus wink for historians. Von Liechtenstein was a real person: a thirteenth century German knight, he wrote poems and chivalric treatises and was (according to himself, at least) a skilled jouster. He’s probably most famous for his dubious ‘autobiography’, in which he detailed his exploits travelling the countryside dressed as the goddess Venus while challenging men to jousts. I would have also enjoyed seeing Heath Ledger in this role. Yes, the armour is generally terrible (and all from about a century after when the film is meant to be set), but the movie does introduce the concept of specialised armour made exclusively for jousting, which was, indeed, an idea which developed around this time. And no, the name of the film A Knight’s Tale has absolutely nothing to do with Chaucer’s ‘The Knight’s Tale’, but the character does get in a throwaway reference to what in fact was his earliest major work, The Book of the Duchess. Really, for a 2001 movie aimed at teens, A Knight’s Tale is surprisingly packed with historical Easter eggs. Tournament competitors were often required to provide up to four generations of noble ancestry in order to compete. Other names simply mentioned in passing – Piers Courtenay or Roger Mortimer – are also names of historical figures. You may have indicated in which events you wished to compete by giving a corresponding hanging shield a whack. A big party, including feasting and dancing (although probably not the music of David Bowie) would often follow a tournament. I especially appreciate the inclusion of foot combat in the tournament setting, often overlooked for the glamour and cinematic appeal of the joust. This movie has grown on my over the years. I love it more now than I did when it first came out, and, amazingly, I love it even more having devoted many years to the study of the Middle Ages, and, specifically, to the tournament. I always enjoy recommending it to people (and seeing their confused looks when I do). And now I am recommending it to all of you.